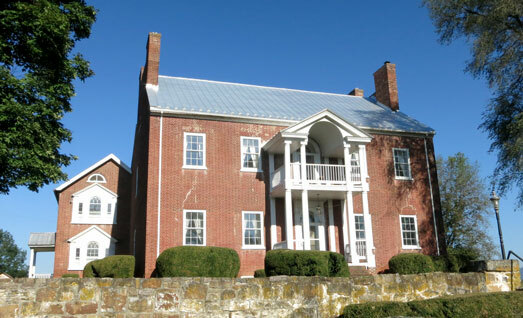 OLD FIELDS, West Virginia (Oct. 9, 2015) – – Willow Wall, a majestic plantation home that served important roles for both North and South during the Civil War, will be offered at auction Friday, November 6, with Woltz & Associates conducting the auction. The Hardy County estate, built between 1804 and 1811, served as a center of activity for McNeill’s Rangers and was used by both Union and Confederate physicians as a hospital. It will sell to the highest bidder over a minimum bid of $499,000. Sealed bids are being accepted until noon on the day of the live auction. “It’s simply unheard of to find a property of this quality and historical significance for such a low minimum — especially a palatial mansion such as Willow Wall. It has been extensively renovated and restored to its full grandeur and more,” said Jim Woltz, president of the auction company. Built in Georgian Palladian plantation style, the 8,300-square-foot home is listed in the National Register of Historic Places. “This mansion itself has incredible features and craftsmanship, including original two-inch-thick heart pine flooring, hand-carved mantels, windows, and doors with hardware. It has seven bedrooms and 16 fireplaces. Despite its historical significance, it has been updated with such features as granite countertops, modern systems, and geothermal heating and cooling,” said Woltz. The 12.2 acre estate also has a courtyard with a fountain, three outbuildings and a fenced pasture. “The location is easily accessible to Northern Virginia and Washington D.C.,” Woltz noted. Woltz personnel will be available at the estate to provide preview inspections from 1 to 5 p.m. Oct. 18, Oct. 25, and Nov. 1, and from noon to 4 p.m. on Friday, November 6, the auction day. The auction will begin at 4 p.m. Individuals seeking additional information may call 800-551-3588 or visit www.woltz.com.